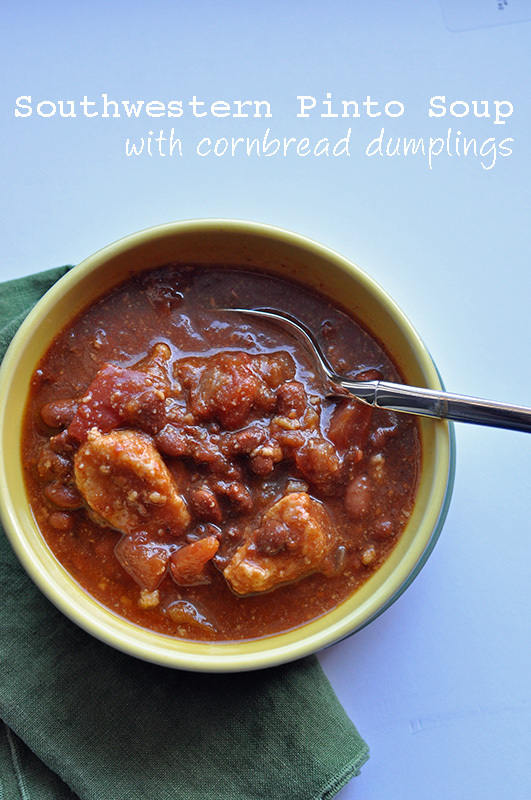 I made this heavenly toasty soup earlier in the week in my way too dusty slow cooker. I need to brush it off and use it more often, it’s just too luxurious to come home to a house that smells deceivingly like a laborious meal. The slow cooker meal feels almost magical, and I get giddy just thinking about it – when I walk into my home after work and after three trips from the car, with two hungry and exhausted kids, 3 ravenous animals, and my hangry self. The very last thing I want to do on a weeknight is cook dinner – we’ve been surviving on multiple days of leftovers and frozen vegetables for the past 6 months. My toddler has been known to say, “Mommy, we been having this last night.” True. Eat it or go hungry kiddo, sorry. Hence the sudden drop in healthy meals on this blog. 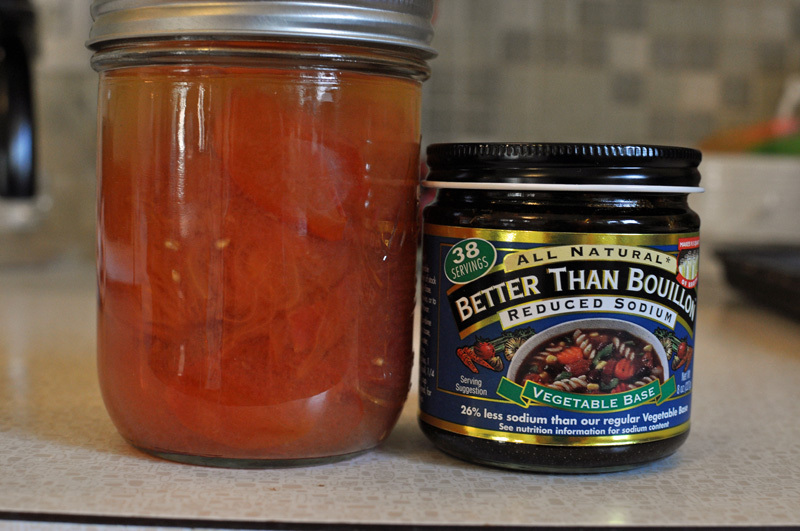 The base of this soup consists of three ways of tomatoes – canned by yours truly, paste, and fresh – and vegetable broth. This soup is a vegetarian recipe and could easily be made vegan. Check out the recipe below. My only other news is that we are slowly but surely organizing our lives in Iowa. Funny how a move and a baby can throw your whole world into chaos. 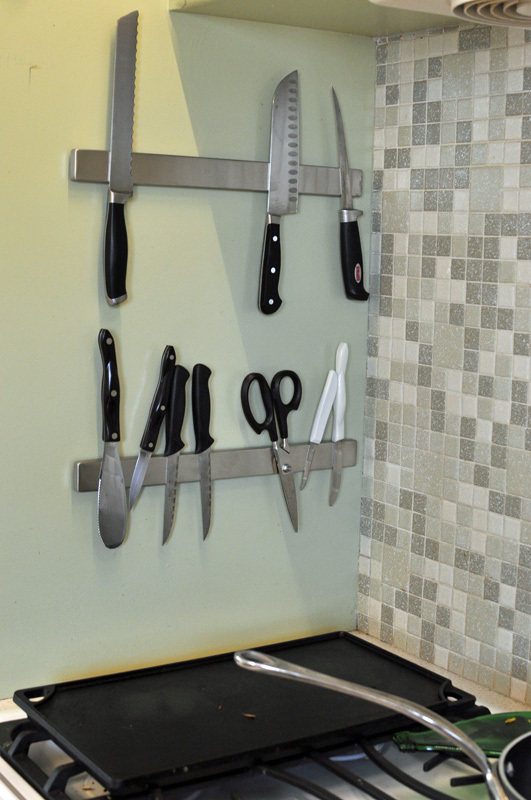 😉 I love my new Ikea Magnetic Knife Strips but am still dreaming up ways to beautify gut my kitchen. 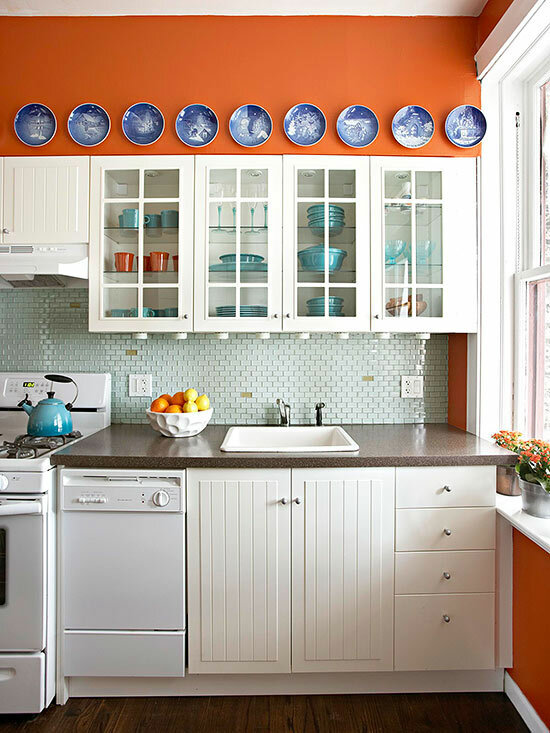 This kitchen speaks to my orange-loving soul! 1/2 yellow onion, diced and 3 cloves of garlic, minced. 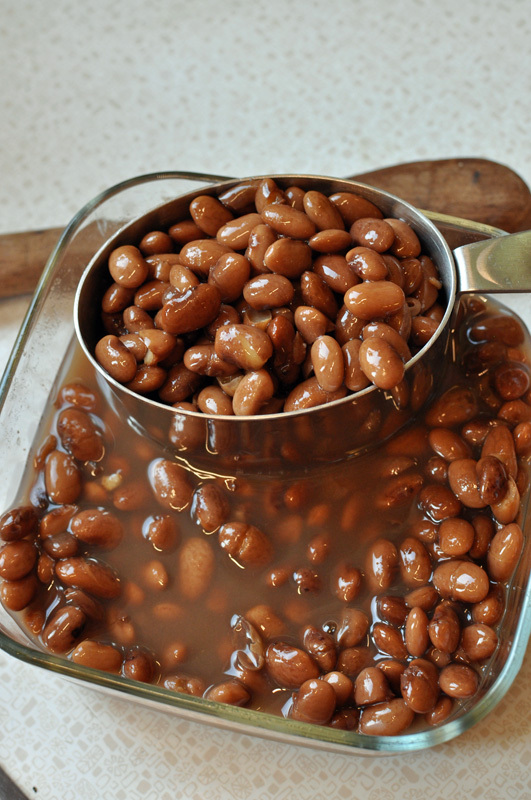 2 cups cooked pinto beans, 1 can diced tomatoes, 2 cups vegetable broth, 1 teaspoon chili powder, 1 teaspoon ground cumin, 1/2 6 oz. can tomato paste, 2 chopped fresh tomatoes. 2 tablespoons of water, 1 egg (to make vegan, swap egg for 1 tablespoon ground flax-seed with 3 tablespoons water), and 8 tablespoons corn flour. Drop spoonfuls of batter into hot soup, cover and let cook 30 more minutes. Serve with sprinkling of cheese and splash of lime juice. I finally finished a sewing project I started well before winter break – a new apron to wear when I am facilitating the creative mess in my classrooms. I am pretty excited with the finished product – the denim came from the remnants section at the fabric store and the pockets from an old pair of Eric’s pants. The pattern is traced from a beloved apron that I have had more than ten years now. I got it on clearance at the Whitney Museum in New York City and it has seen many a project in its day. It is not worn out beyond wearing yet, but it has been repaired and reinforced dozens of times. I love three things about this apron – the roomy pockets, the durable canvas (you can start to see the worn spots at the bottom of the pockets), and the fact that the ties are adjustable. Simply pull on the two ties and the entire apron raises up to the perfect fit. 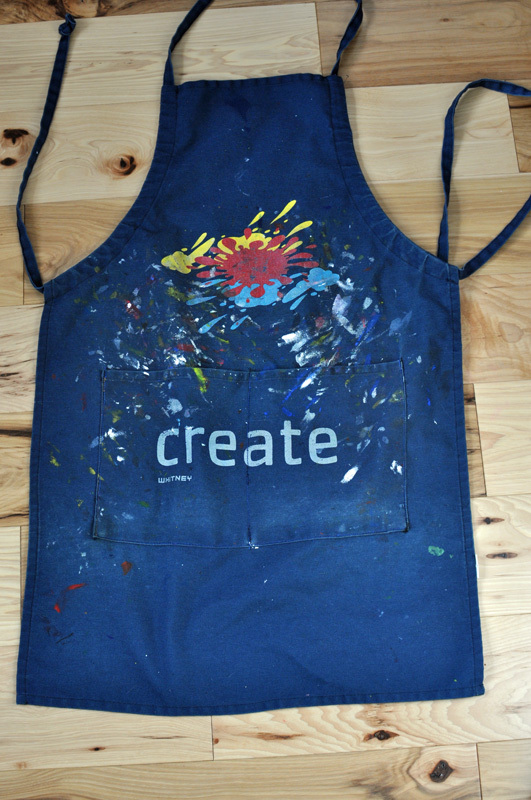 Now that I am teaching in two different schools, I wanted a second apron to prevent the clay dust and paint flakes filling my bag anymore than they already do, so I had to make a second apron. I simply laid the existing apron on the denim and traced a pattern. 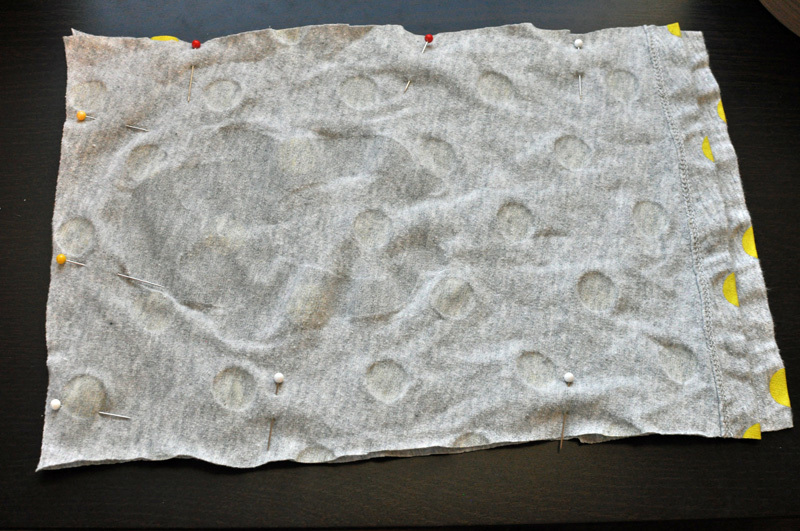 I left plenty of room for seams and sewed it up, making sure that i had several heavy-duty denim needles ready for my machine. 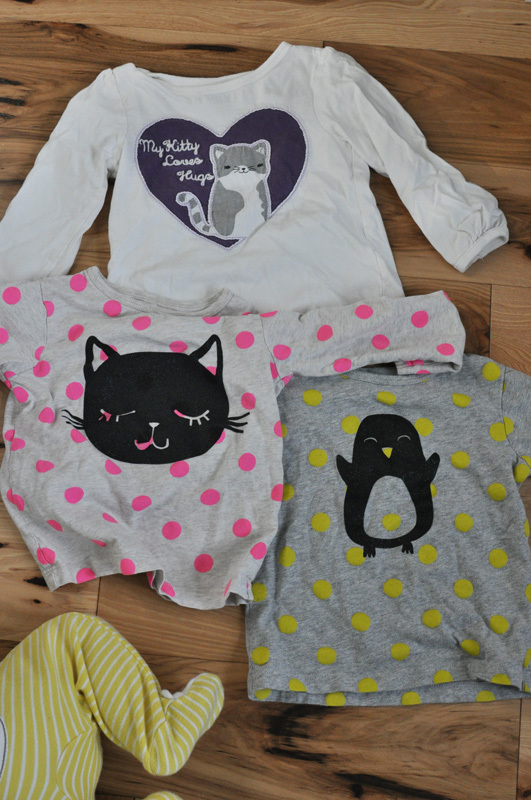 This is one area where it pays not to be stingy – fresh needles make all the different in the world of sewing. 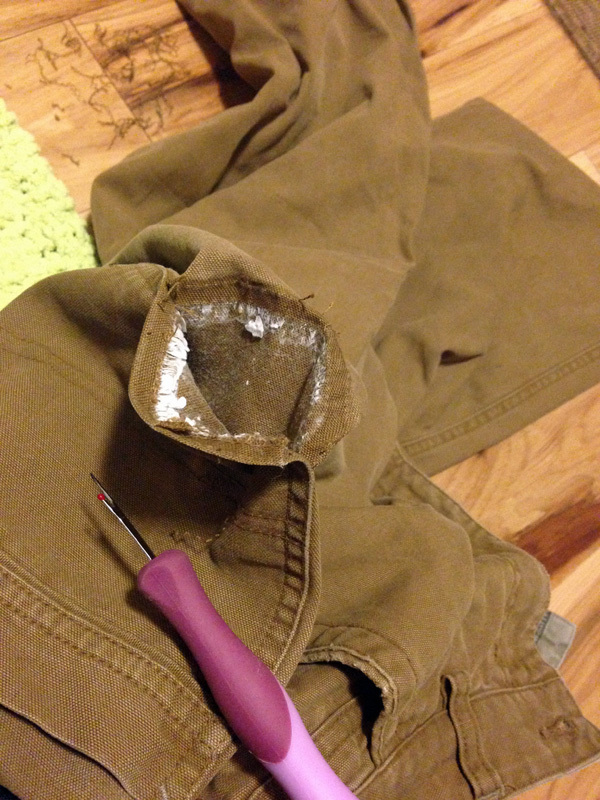 For the pockets, I dismantled a pair of much-loved canvas pants of Eric’s. He wore them to ride to and from work frequently, and they have some wear and tear resulting from thousands of miles on a bicycle. I got to taking apart the back pockets, which took quite a bit of seam ripping – a testament to the durability of the REI brand pants. Oops, looks like Eric washed something in the pocket. For the tie, I simply used strips of the canvas pants sewn in half. I left the edges raw, which means they will fray over time. I figure if I hate them, no big deal, I will make a new tie with finished edges or use a length of store-bought cord. 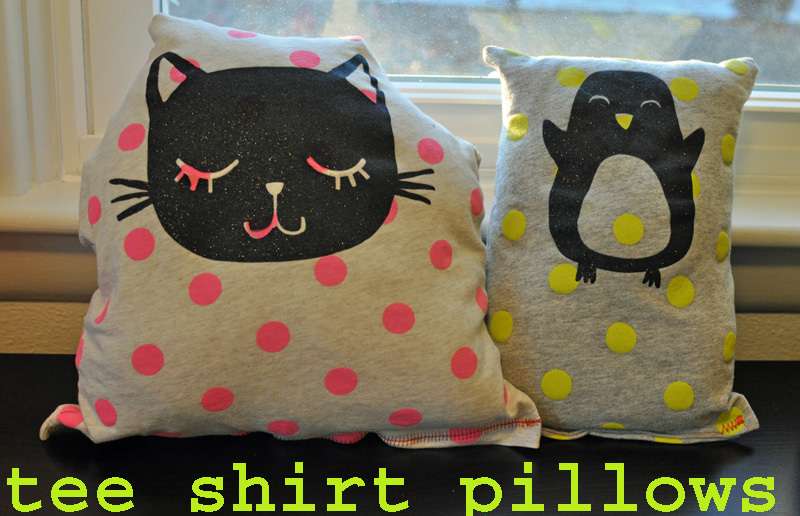 I am lazy sometimes when it comes to sewing projects, and I will sometimes use contrasting thread simply because I do not want to make a new bobbin if I do not have one waiting and ready to go. I opted for orange thread this time mostly because it was already set up with orange. 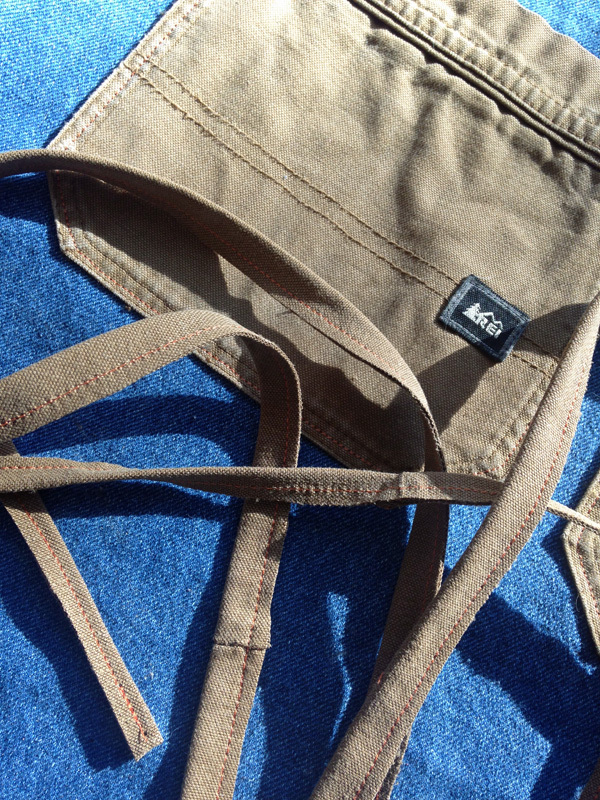 However, it is my favorite color and a nice contrast on the blue denim with the brown canvas. 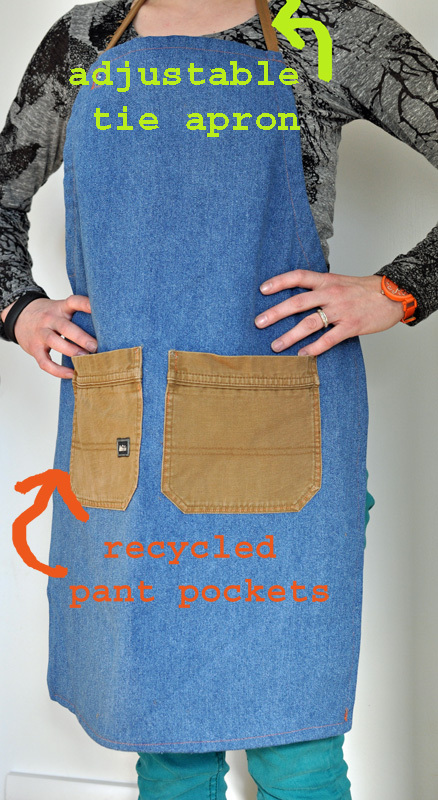 My next project – using the leftover denim and canvas to make Eric an apron for when he is working on bikes. Maybe it will help preserve his clothing from bike grease. 6 months and a New Year! Oh Happy New Year to you! I admit, I was in bed last night by 9:30 and it was GLORIOUS! My littlest one, who is now 6 months(!! ), was in bed by 6:30 and then up again at 9:30 and after the second time up, I took my cue to get to bed. It was worth it – he made it for an almost 6 hour stretch of sleep. I tell ya, I don’t know what I will do when I finally sleep through the night again. After five and a half hours of sleep I feel I could conquer the world! Christmas came and went and now I sit here facing a new year chock full of milestones for both kids, events with family and friends, and always new opportunities. 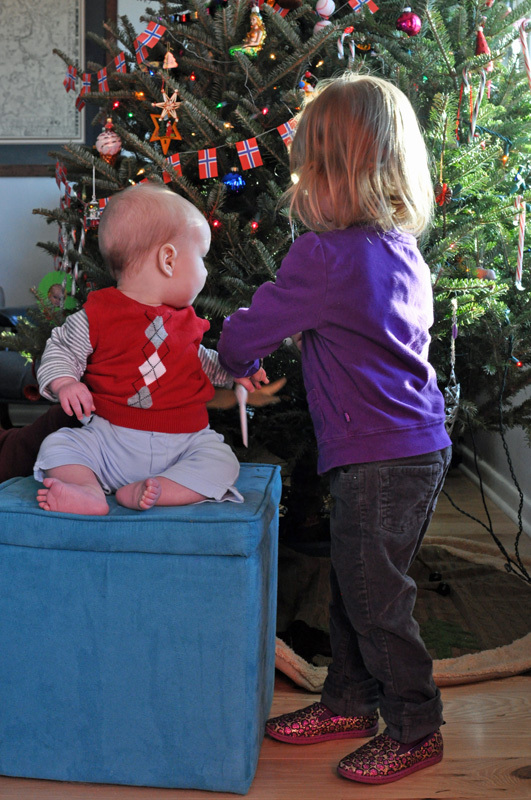 Of all the posed and practiced shots from the holidays, this is my favorite. Older sis, desperately trying to prevent younger brother from grabbing ornaments off the tree, all the while telling him to, “Look at mommy!” Meanwhile, my hubby is just off camera, laughing, and holding Q up. Oh what a Christmas it was, indeed. Seeing the wonders of Christmas through a child’s eyes is truly magical. Now that there are two of them, it is twice as magical. 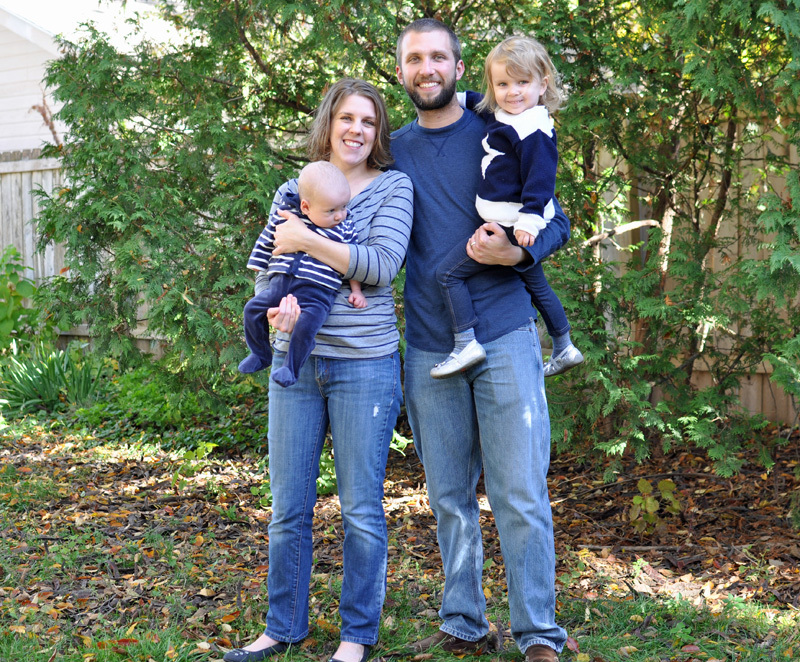 Read on for a much overdue update on our family, or just skim/skip and look at annoyingly cute photos of my clan. Whatever suits your mood. 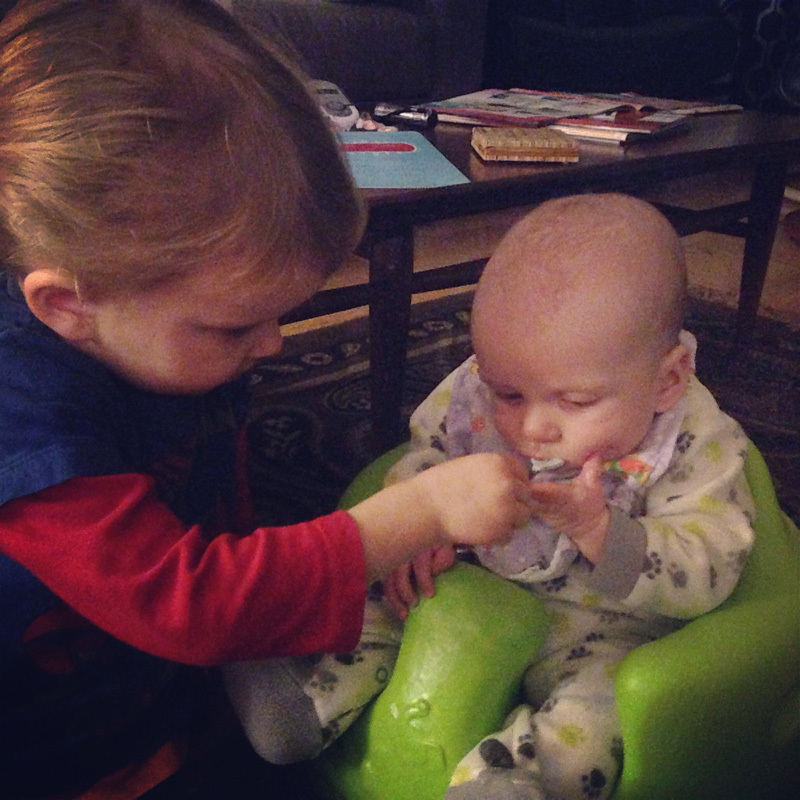 One of the highlights of the past 6 months was watching Greta spoon feed her brother some of his first solids (listen to me, I know! I sound ridiculous, or I guess like a nursing mother appreciating sweet relief!). I stood by making sure she didn’t push the spoon in far enough to gag him! 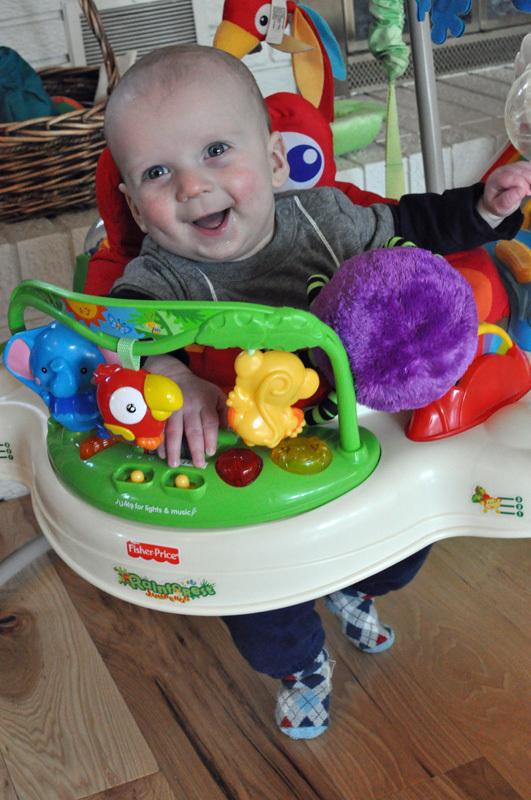 Solids have made all the difference in his attitude during the day – not so frantic and very eager for mealtime. I just hope it wears off on sister and some friendly competition kicks in and kills the toddler picky eating. This kid cracks me up – such a charmer and loves to jump and move. He is itching to crawl. This break he has been working hard on sitting on his own. The dog, cats, and sister are all incentives for him. Meanwhile, toddler sister’s artistic side is blossoming. 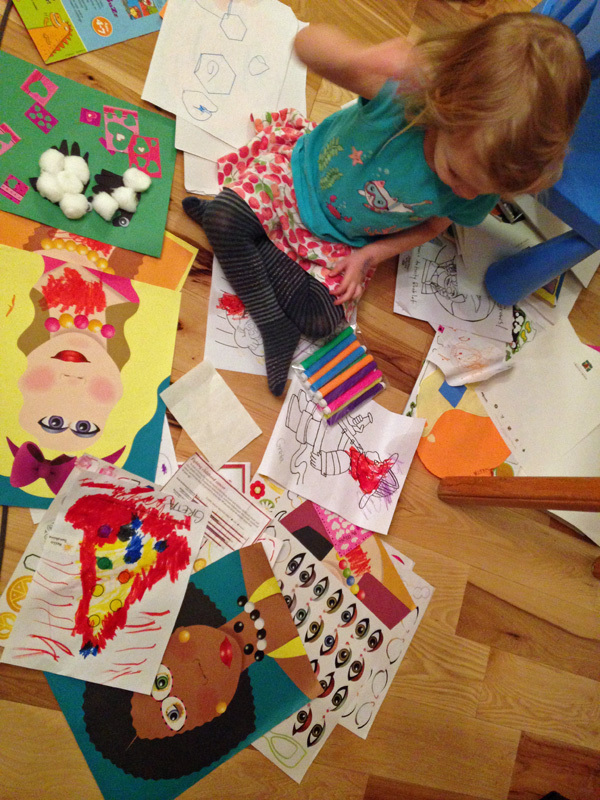 I love watching her color, draw, and sticker away. Her creative side really shines by her love of patterns in the dressing of herself. 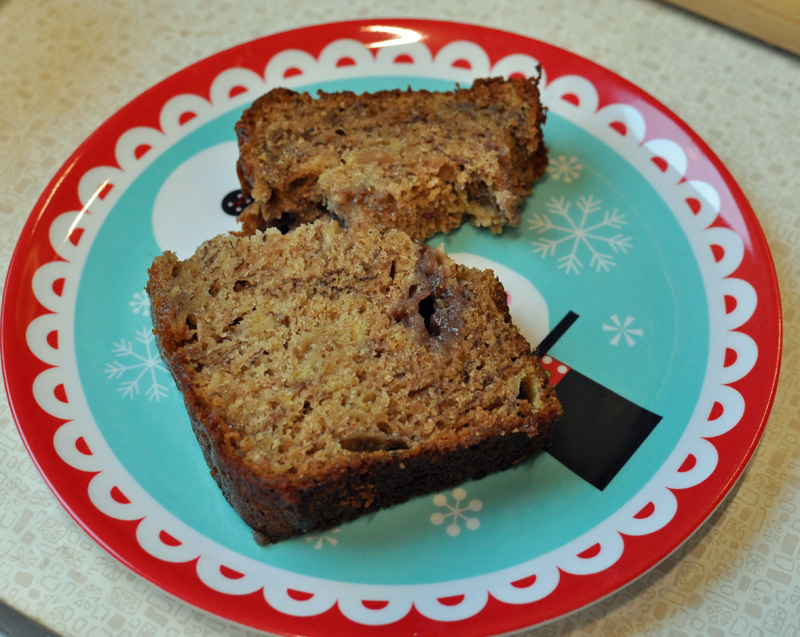 I discovered a new quick bread over break – peanut butter and jelly banana bread. It is from Better Homes & Gardens and definitely my new go-to banana bread recipe. 1. Read more (silently, not aloud to children). I do plenty of reading to my own two kids, as well as my students. I want to read more fiction, best-sellers, non-fiction…you name it! I have been on a short kick reading eBooks, but want to get back into physical books. 2. Make weekly time for creating. Let’s face it, having kids takes up all your time. Oh do I miss my own hobbies. However, I don’t want to miss the amazing things happening so quickly in their lives. So, I figure, weekly is not overdoing it by any means at all. Hopefully, as I begin to sleep more, I can carve more than weekly time for creating. This one is an important resolution, as I have finally figured out that I need to create like some need to go on runs. 3. Spend more time appreciating my dog and two cats. 2/3 of my animal friends are elderly and facing some health issues. Sometimes, I admit, I let it get to me. 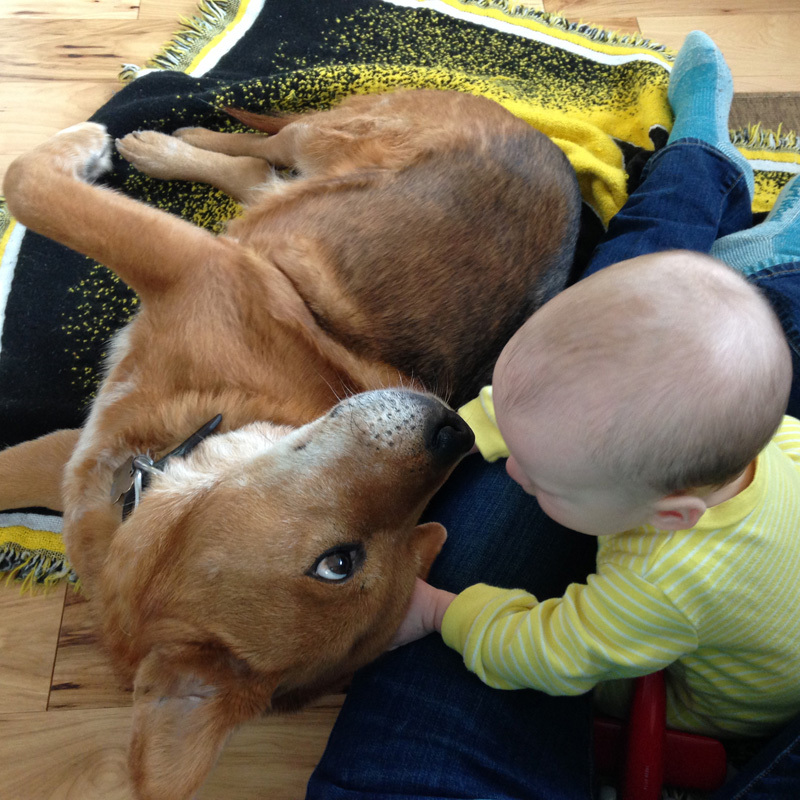 I caught my toddler using her foot to roughly move a cat out of her way the other day and saying in a far too familiar way – “Move, move!” Time to slow down, appreciate the furry members of our family, and model loving and endearing behavior for my children. There you have it, my resolutions for 2015. What goals have you set for yourself?